Our no-nonsense e-dailies serve one purpose—to make money for you, the gaming industry investment professional and corporate level executive. Publisher Frank Fantini and staff make sense of the most arcane financial information through a unique conversational writing style. More important, you receive the information critical to your investment and business decisions. Fantini Reports are a gaming industry standard utilized by analysts, institutional investors, investment bankers, casino operators, gaming manufacturers, architects and more. If you need to make a decisions based on gaming happenings make sure you subscribe to the Fantini Gaming Reports. 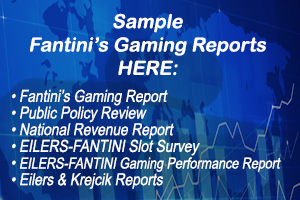 “Fantini’s Gaming Reports continue to be an invaluable, reliable resource for timely, accurate news about the gaming industry."